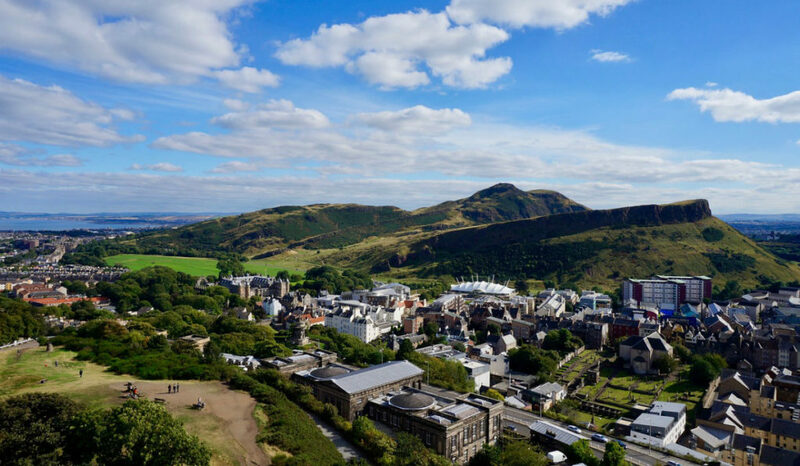 Overlooking Scotland’s capital, the ancient volcano, Arthurs Seat sits at 251 metres above sea level providing magnificent views of the city! It is located within Holyrood Park, the 640 acre Royal Park at the stunning Holyrood Palace; the official residence of The Queen and The Royal Family in Scotland. There are a few different options to get to the top; you can take on the steep climb to the summit or enjoy a gentler low level approach. Whichever route you take, the views are definitely worth it and a must for any keen walker if visiting Edinburgh. This walk is also very popular for locals in Edinburgh and in Scotland. The Fife Coastal path, Covers 117 miles from the Firth of Forth to the Firth of Tay. The walk offers some of the best coastal views in Scotland. The route is split into 8 main walks with varying levels of difficulty. However the beauty of the path is that you can do as little or as much as you like depending on your experience. 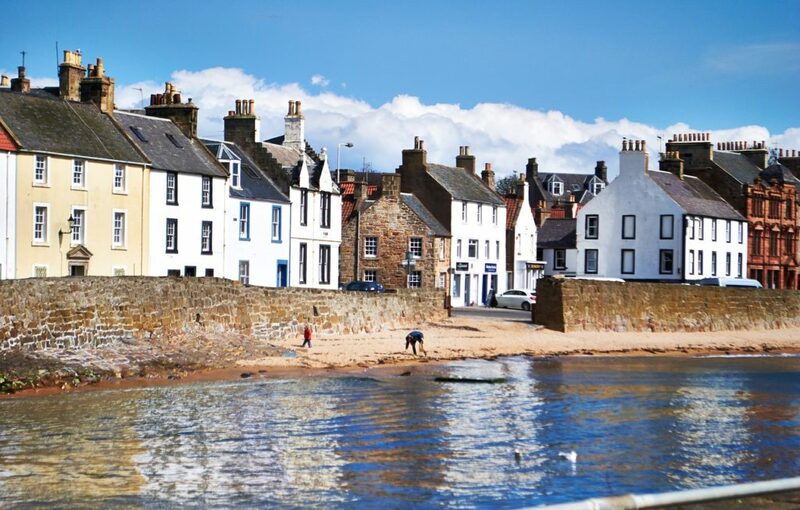 The path connects ‘The Home of Golf’, St Andrews to former coal mining towns and the picturesque fishing villages of Crail, Elie, Pittenweem and Anstruther where you can explore around the charming shops, cafes and harbours. Along the way there is so much to see and do including historical sights, museums and award winning beaches perfect for enjoying your packed lunch and a quick rest. St Andrews to Kingsbarns (approx. 8.4 miles). Estimated time 3.5-4 hrs. Kingsbarns to Crail (approx. 6 miles). Estimated time 3-3.5 hrs. Crail to Anstruther (approx. 4.2 miles). Estimated time 1.5-2 hrs. A total of 73 miles, The Great Glen Way begins at the end of The West Highland Way and connects the town of Fort William and the city of Inverness, ‘The Capital of the Highlands’. The route follows the major natural fault line of the Great Glen dividing the Grampian Mountains and the Northwest Highlands. It also runs alongside Loch Lochy, Loch Oich and the famous Loch Ness. Obviously, we wouldn’t expect you to do all 73 miles in one go, so as with the Fife Coastal Path, The Great Glen Way is also split into main sections. Generally, a straight forward walk in Scotland for long distance walkers. However there are some steep sections within the forest above Loch Ness. There is now the option to take a higher-level route from Fort Augustus to Drumnadrochit which is rewarded with some spectacular views. Inverness to Drumnadrochit (approx. 18 miles). Estimated time 7-9 hrs. Drumnadrochit to Invermoriston – low route (approx. 15 miles). Estimated time 5.5-7 hrs. Drumnadrochit to Invermoriston – high route (approx. 14 miles). Estimated time 6-7.5 hrs. Hidden in the stunning pine forest of Rothiemurchus, lies Loch an Eilein or ‘Loch of the Island’ (translated from Gaelic). Surrounded by the scenic landscape of the hills and mountains of the Cairngorms National Park, Scotland, the gentle walk, suitable for all, will take you around the tranquil loch. 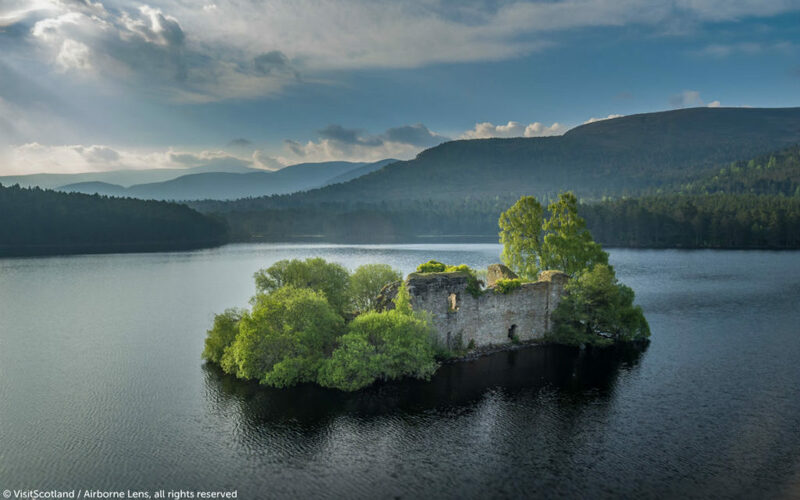 Located in the middle of Loch an Eilen, is the ruins of the 13th century island castle. To extend the walk you can also walk the smaller Loch Gamhna or climb Ord Ban to experience some of those wonderful views. One of Scotland’s most beautiful areas, Loch an Eilen was voted Britain’s best picnic spot! Approx. 4.5 miles. Estimated time 2 hrs. 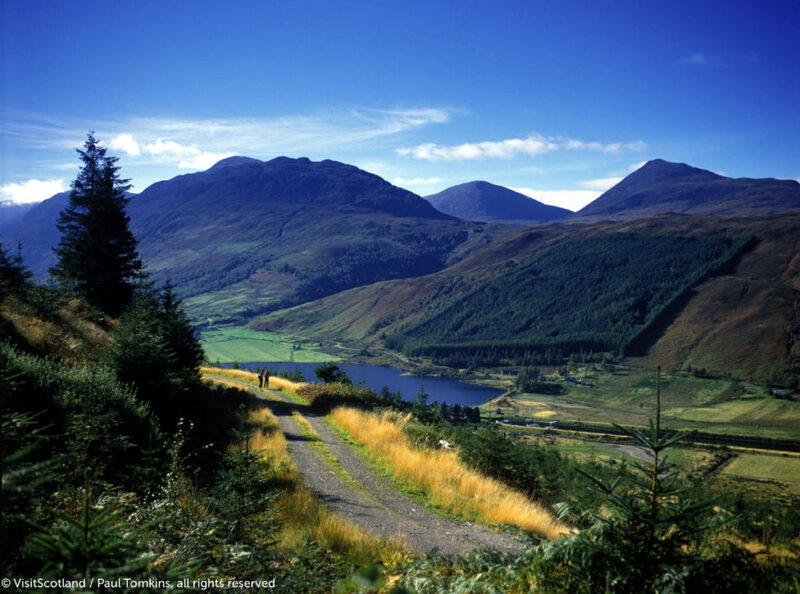 Scotland’s most popular walking route, The Famous West Highland Way was the first long distance route in Scotland. People from all over the world travel to Scotland every year to take on the 94 miles stretching from Milngavie, to Fort William at the foot of the iconic Ben Nevis, Britain’s highest mountain. We recommend taking on the section along the east side of Loch Lomond. 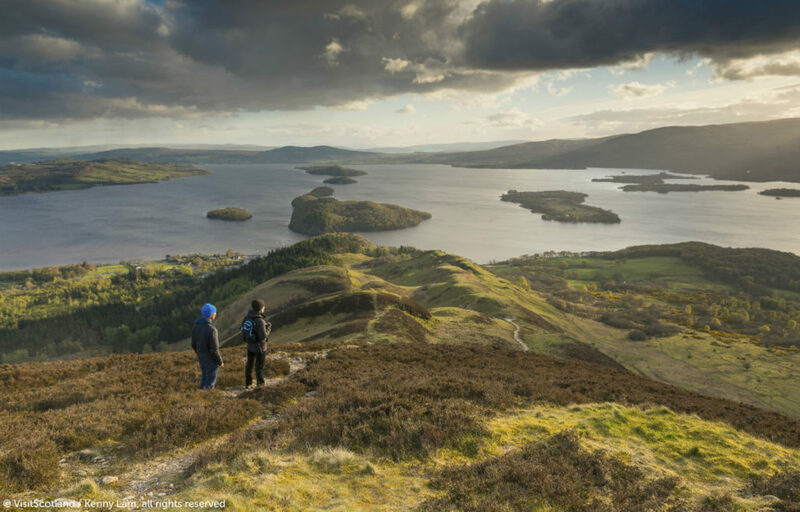 From Drymen follow the forest tracks, then over moorland to reach Conic Hill which offers simply amazing views of Loch Lomond and it’s islands – one of the highlights of the Way! You can then continue on to what is surprisingly considered the toughest section through more forestry and rugged, rocky lochside pathways to reach Inveranan. Drymen to Rowardennan (approx. 14 miles). Estimated time 6-7 hrs. Rowardennan to Inverarnan (approx. 13.5 miles). Estimated time 6-7 hrs. If you are interested in walking in Scotland during your tour, please specify on our enquiry form. Also for further information on all walking in Scotland please click here.